Welcome to the third installment of this year’s Trade Value series; you can see the links to the honorable mentions and the last 10 guys in the list in the toolbar above. If you’re not familiar with this project, there’s an explanation of the process in the HM post, so that’s the best place to start. As a reminder for those who don’t like clicking links, however, the five-year WAR projections are based on Dan Szymborski’s ZiPS forecasts, though the players aren’t ranked based on those projections; these figures are included merely as a piece of information to help round out the picture. The guaranteed-dollars line measures the amount of money the player is owed outside of team options or arbitration years; for most of these guys, team options are very likely to be exercised, and many of them will end up making more than the guaranteed-dollars number reports. No need to delay any further; let’s look at the 10 guys who made today’s cut. The Braves had to turn away something like half the teams in baseball after acquiring Inciarte, underrated no longer, from Arizona. Instead, Atlanta kept their new center fielder for themselves and then signed him to a long-term extension that makes him one of the biggest bargains in baseball. Inciarte doesn’t have enough thump in his bat to turn into an impact hitter, most likely, but he has top-of-the-scale defensive value and is roughly a league-average hitter, a combination which makes him a borderline star. Teams still don’t pay for defense like they do for offense, of course, and there’s always the concern that fielding value peaks early and is susceptible to getting destroyed by injury, but Inciarte is so good in center field that there would still be a long line of suitors if the Braves made him available. Thanks to some guy named Freeman, he’s not the Braves’ franchise player, but there aren’t many outfielders in baseball you’d rather have than Inciarte, especially considering he’s guaranteed just $24 million over the next four years. Inciarte is an All-Star being paid like a mediocre bench guy for the duration of his prime years. And that’s why Atlanta just keeps telling everyone he’s not available. In some ways, Bregman is a bit of a test case for the predictive power of Statcast data. On the one hand, he’s a 23-year-old who has already produced a better-than-average career batting line, and whom most people think would still be playing shortstop if it wasn’t for Carlos Correa’s presence in Houston. As noted in the Russell and Inciarte write-ups, an up-the-middle guy who hits near league average is a pretty nice thing to have, and Bregman’s minor-league numbers suggest that there’s more offensive upside he hasn’t yet tapped into. Without Statcast data, we’d look at Bregman and see a high-floor/high-ceiling guy, the kind of player who is already good and could become great. ZiPS is obviously a fan. But as Tony Blengino noted back in March, Bregman’s batted-ball data from 2016 was “a mess” and suggested his solid rookie numbers were unsustainable. Bregman’s power has indeed regressed this season, and there are still a lot of red flags here, as he remains a pull-heavy hitter who makes weak contact on grounders yet still hits a lot of infield flies. But he’s also improved his contact rate by eight percentage points this year, and cut down on his chases out of the zone, so if he can keep his walks and strikeouts in line, he doesn’t necessarily have to be a guy who also crushes the baseball regularly. So, is Bregman a potential middle infielder with a good bat and upside or a corner guy with limited power who will struggle to hit for a high average due to his pull and pop-up tendencies? Enough people in the game voted for the former that I don’t think his stock is down much from a year ago, but it will be interesting to see where he sits on next year’s list. Since debuting in 2014, deGrom has established himself as one of the game’s best pitchers, and unlike every other teammate of his that throws the ball for a living, his arm hasn’t yet exploded. With three years of control remaining after this one, deGrom is exactly the kind of high-quality controllable starter for which seemingly every contender in baseball is looking at the moment. But whether right or wrong, there’s something a bit scary about trading for a Mets pitcher these days. deGrom looks healthy right now, throwing the hardest he ever has in his career, but he missed the end of last season with elbow troubles, and the fact that the Mets haven’t been able to keep any of their other starters healthy isn’t particularly reassuring. The fact that he’s 29 and has only thrown more than 180 innings in a season once in his career is also a little worrisome. Teams are always hesitant to overly invest in health risks, and as good as deGrom is, he’s still a health risk. But the upside is undeniable. He’s probably a top-10 starter with three more trips through arbitration coming, and his reduced innings totals and lack of awards to this point means arbiters aren’t going to give him extremely large raises. If you knew deGrom were going to be good for 600 innings over the next three years, he’d be in the top 15 on this list, and maybe the top 10. So while he’s a bit of a risk, he’s also a dominant frontline starter, and those generally don’t come risk free. If the Mets decided to take advantage of the demand for controllable starters this summer, they could get a very good return for Jacob deGrom. Taillon is just 25, but he’s already had Tommy John surgery, been hit in the head by a line drive, and most recently overcame cancer. His medical file is longer than you’d like for a young core piece. On the other hand, he’s certainly shown he can overcome adversity. And when he’s been on a big-league mound, he’s been excellent. He’s more of a strikes-and-grounders guy than a dominant strikeout machine, but if his changeup improved enough to help him put lefties away, he could easily take another step forward. And he’s already quite good. Like with almost every pitcher we’ve written up so far, Taillon is both high risk and high reward. But unlike the guys we profiled yesterday, Taillon still has two more years before he reaches arbitration, so there’s a bit more reward here than with a lot of the other high-risk young arms. If Taillon can stay healthy and pitch like he’s pitched to date, he’s one of the most valuable young arms in the game. That’s still an if, but it’s an if worth betting on. Few players in the game have improved their stock more than Severino in the first half of the year. A well-regarded prospect who went the wrong way last year, Severino came into spring training fighting for a job in the rotation. Lucky for the Yankees, they gave him one, and he’s rewarded them with a half-season of dominance; he’s one of just five starting pitchers to post an xFIP- below 70 so far this year, and three of the other four have already won at least one Cy Young Award. Of course, all the usual caveats apply to a 23-year-old with a half-season of dominance under his belt. Major-league hitters could figure him out again, and he could fail to make the necessary adjustments. He’s a pitcher, so he could get hurt. He’s on year three of an above-average HR/FB rate, so he might not be as good as his BB/K/GB rates suggest. But a 23-year-old blowing away hitters in the AL East, sitting 97 with his fastball, and showing a much-improved changeup has pretty obvious upside. If he keeps pitching this well for the next year, he’ll be a threat to be in the top 10 on next year’s list. The track record is still a bit short for that now, but just as the Yankees have found a monster in right field, it’s possible they’ve also found an ace on the mound, too. Every year, there’s a guy on the list who is basically impossible to rank. This year, Syndergaard is that guy. Scared enough of the lat tear that has sidelined him for most of the season to think that he’s too risky to give up a significant package for? Perfectly logical. Still see the second- or third-best pitcher in baseball, at age 24, who should be back from a non-elbow injury before the end of the year? Yeah, me too. 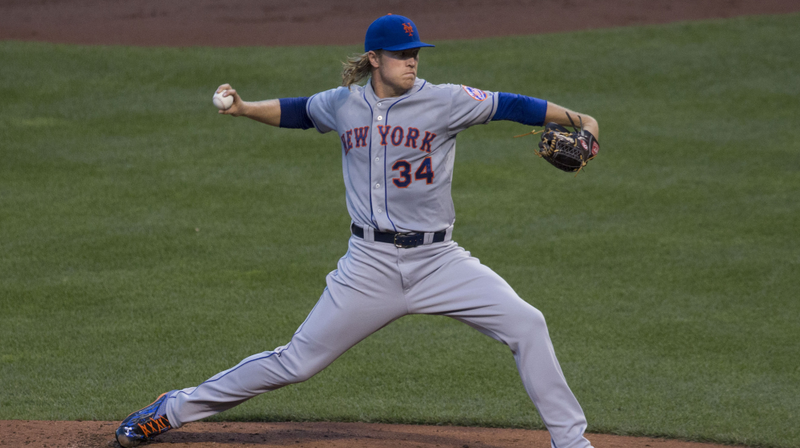 If you bet big on Syndergaard now, you could be rewarded with the most valuable pitcher in baseball, when performance and contract are taken into account. Or, if you bet big on Syndergaard now, you could be giving up a bunch of talent for the right to oversee his rehab assignments, since we don’t actually know if a pitcher can stay healthy throwing as hard as Syndergaard does every fifth day. I realize that the high-risk/high-reward mantra has gotten worn out at the back end of this exercise, but no one exemplifies that dichotomy more than Syndergaard. If you don’t want to bet on a pitcher with arm problems, I don’t blame you. If you don’t want to pass up an elite talent simply because he’s currently on the DL, I don’t blame you, either. You can basically put him anywhere on this list and have it be both defensible and absurd. So I’m putting him here, because I don’t know where else to put him, and this feels less wrong than anywhere else. Speaking of second-best-pitchers-in-baseball, Scherzer is firmly in control of that title at the moment, last month’s temporary loss of sanity — when people tried to argue that he’d surpassed Clayton Kershaw — aside. As good as he was in Detroit, Scherzer has gotten even better since getting to Washington, and despite not being cheap, has pitched himself into being a huge bargain again. Certainly, there are teams that would look at those $35 million per year salaries from 2019 to -21 and decide they just weren’t interested, but I think it’s pretty obvious that, if Scherzer were a free agent this winter, he’d sign for far more than four years, $120 million he’s still owed after this season. And because the Nationals deferred the entirety of the $105 million he’s owed in salary for those three years until 2022 (when he’ll start receiving $15 million annual payments, which every team in baseball can afford), the actual financial burden he’d place on a team’s payroll is significantly reduced, and the present value of the remaining obligations is closer to $100 million. He does turn 33 in a few weeks, and any $100-plus million commitment for a player his age will scare off some bidders, but there are enough teams who could use an ace and could easily absorb Scherzer’s contract that the Nationals would be able to extract a significant return if they wanted to move him. Which they don’t, because he’s awesome. Perhaps the game’s most durable ace, Bumgarner’s streak of 200 inning seasons will come to an end this year, thanks to his decision to go dirt-biking on his off-day. But after completing a successful rehab start last night, Bumgarner looks poised to re-join the Giants this weekend, and at this point, there’s no reason to think his DL stint would have a significant impact on his trade value. Which, of course, remains quite high. Bumgarner is one of the game’s premier pitchers, is the game’s best hitting pitcher, and doesn’t turn 28 until the day after the trade deadline. The Giants owe him just $24 million over the next two years, and even those are team options. To get multiple years of a player at this level for this price would cost a fortune. And to this point, there’s no indication that the Giants are even willing to listen to offers for their ace, even though they’ll be sellers over the next few weeks. When you have a player this valuable, you generally just want to keep him. And that’s likely what the Giants will do with their ace, at least for another year. If the team doesn’t turn it around in 2018, however, and Bumgarner doesn’t prove willing to sign another long-term extension, we could be talking about him as the biggest trade chip of next summer’s deadline. Maybe the most visually spectacular defender in the game, Arenado has turned himself into a legitimate superstar. Playing in Colorado inflates his power, as it does with most hitters, but he makes a lot of contact and is a good hitter even after adjusting for his home ballpark. The only real downside, and why he fell 23 spots from last year, is that he’s marching towards free agency, and his Super Two status has allowed him to reach some pretty lofty salaries through arbitration. He signed a two-year deal that bought out his coming trip through the process but guaranteed him nearly $18 million in the process, and assuming he has another typical season next year, his final arbitration number could push $25 million. Of course, $43 million over two years is still a fraction of Arenado’s market value; he’d blow past $200 million on the open market with ease. Like Bugmarner, though, we might actually be talking about him as a potential trade chip next summer if the Rockies can’t get an extension done in the next 12 months. Players like this are too valuable to let walk in free agency. For the Rockies’ sake, I hope they find a way to keep their franchise third baseman in Denver. We hoped you liked reading 2017 Trade Value: #31 to #40 by Dave Cameron! Thanks for the series, Dave–as always, it’s a great refresher during an otherwise slow week of baseball. Chris Sale thanks you for the confidence in his second half. How is it possible that Chris Sale has never won a Cy Young award? I must have combined him with Corey Kluber in my head or something. Just looked at Sale’s stats. He’s on pace for one of the all-time great seasons–he’s already got 5.3 WAR at the ASG. That’s more WAR than he had all last year! He keeps that up and it’s a prime Randy Johnson-type of season. I knew he was having a good year, but that’s insane.